BLACKS, YOUTHS AND WE THE PEOPLE AT C.P.A.C. Most impressive at CPAC was the upbeat, excited and empowered atmosphere. With Scott Brown's miracle win in Massachusetts and stopping the government's take over of health care under our belts, We The People were feeling good and strutting our stuff. This was a dramatic contrast to the mood of CPAC last year. Obama had the house, the senate, and the American people under his spell. His agenda appeared unstoppable. Like the song, "What a Difference a Day Makes," what a huge difference a year made. To my dear gloom and doomers, I offer a famous quote, "the only thing needed for evil to prosper is for good men to do nothing." At CPAC, I saw an army of young, brilliant and enthusiastic conservatives waiting in the wings for their opportunities to fight. 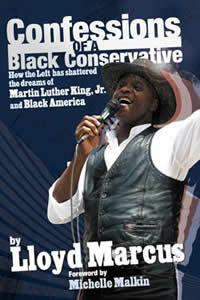 I met proud grateful black Americans who did not drink the Obama Kool Aid eagerly pursuing their dreams. Our conservative future, as the song says, "looks so bright we have to wear shades." So let us bask in our successes and continue to make the weak links strong. Together, we can do this. Together and with a smile from God, we will restore America!